Black sock on the railing—the universal symbol for depressing one-night stands. If there is one reoccurring theme in good hipster interior design, it is the use of linear geometry is innovative ways. 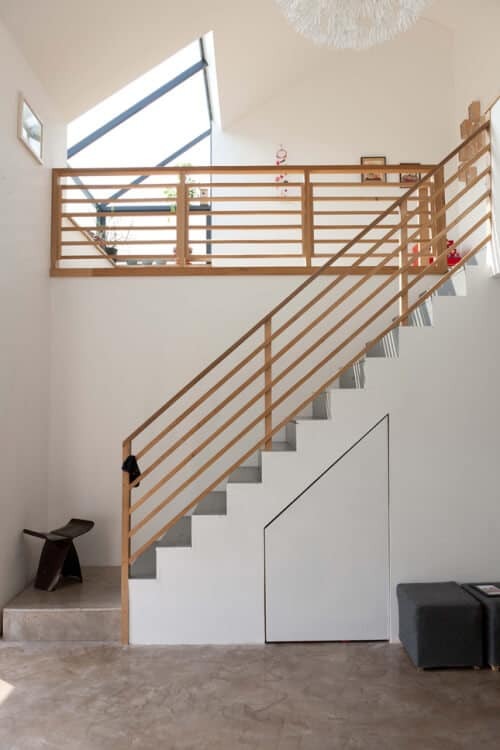 See how the lines of the skylight match and mimic the zig-zag of the staircase, which is then further accentuated through the clever use of a quirky inlying panel and the bottom floor. The panel most likely displaces, making way for storage, however its main function is to create a triplicate in design style. The earthy tones of the marbled floor are functional enough in color to sustain a high amount of foot traffic, never allowing dirt to show easily, while the hues themselves area the perfect pairing to the wooden hand railing of the staircase and its balustrade. In a room as large as the one seen above, an enlarged chandelier is always a fantastic idea. Again, one can see the careful eye of this designer coming into play as the hanging motif is repeated on the top floor by means of a colorful mobile. Inviting, spacious, and filled with light, thanks to the massive skylights, this is the perfect entrance way to any modern home. The walls are adorned by nothing more than a few well selected, simple paintings, while a more contemporary decoration featuring seven square framed images, is also set to a zig-zag alignment, offset, and accentuate the staircase as well.